After a week in the Philly area rediscovering my local sandwich joints, I came back to Seattle with the fresh taste of hoagie rolls lingering in my mouth. Over the next few weeks, with some hints from the folks at the Conshohocken Italian Bakery, I managed to replicate them. I'd had Conshohocken Bakery's rolls at Pudge's, famous for steaks and hoagies in Blue Bell, PA. My first attempts came out more like baguettes, and so I tweaked the humidity and the flour content, but once I got close the cross-section of my rolls were not super round, and the bite was still too dense. One morning I called the people at Conshohocken Bakery (voted #1 Italian bakery in the region) and told them what I was doing. Their head baker listened to my techniques and sorted a few things out. So here you go, sandwich rolls that are as close to authentic East Coast sandwich rolls as you're ever likely to get in a home kitchen. Call them what you want: torpedos, hoagie rolls, subs or zeps. In any case, I think you'll agree they make the best sandwiches around! *To make whey: 32 ounces of plain low-fat yogurt will yield 2/3 cup whey in about 2 hours. Line a strainer with paper towels or several layers of cheese cloth and set it over a pan or shallow bowl. Pour in the yogurt, cover lightly and set it to do its stuff in the refrigerator. The whey will drain from the yogurt and collect in the bowl. Measure carefully before adding. Make the dough: In a large mixing bowl, stir together yeast, sugar and ½ cup of warm water. Let sit for 10 minutes until foam forms on the mixture. Add 20 ounces of flour, salt, ascorbic acid, whey and water and mix to form a cohesive mass, scraping down the sides of the mixing bowl as necessary. Knead for 10 minutes, using as little extra flour as possible to keep the dough from sticking to your counter and hands. Clean out the mixing bowl. First rise: You can start these rolls in the morning (using an extra teaspoon of yeast in the dough) and let rise, lightly covered, for 4 ½ hours at room temperature. In order to have the rolls ready for lunchtime, however, it's best to make your dough the evening before and let it rise, covered, in a 55° environment overnight. Set the dough at room temperature for an hour or two in the morning before continuing. By this time either method will yield dough that has roughly tripled in bulk. Second rise: Punch down the dough and turn it out onto a lightly floured work surface. Push the dough into a fat snake and fold it into thirds. Gently push the dough into a fat snake shape again, letting it rest for a few minutes as it resists. This method will elongate the gluten, yielding the best rolls. Fold in thirds, put back in the mixing bowl, cover lightly and let sit at room temperature (70°) for 1½ hours, until nearly doubled in bulk. Shape the rolls: Turn the dough out onto a lightly floured work surface. Gently shape into a snake again, tucking the long outer edge over itself and squeezing in to the bottom seam by using your fingers. Your emphasis from here on out is to create a gluten cloak, a continuous skin on the top and sides of the rolls. When the snake of dough is about 2 feet long, cut it in half. Form each half into an 18" snake and cut it into three equal pieces. You will now have 6 portions of dough, each weighing between 6 and 6½ ounces. Tuck into cigar shapes and let them rest for 15 minutes. Sprinkle cornmeal onto the cookie sheets or jellyroll pans and have them handy. Warm your 80° humid environment. (See Creating an 80° Environment at the bottom of Aunt Marie's Dinner Rolls.) Your environment should include a pan of hot water. After your rolls have rested, flatten them somewhat to expel the largest gas bubbles, and then fold them gently into torpedoes of dough that are 9" long. Pull the gluten cloak over each roll evenly and tuck into one long seam. Put three rolls on each pan, seam-side down onto the cornmeal. Third rise and preheat: Let finished rolls rise for 1 hour to 1 hours 10 minutes in an 80° humid environment. Line the center rack in your oven with a pizza stone or quarry tiles and preheat the oven to 450° a half hour into this rise. Have a good spray bottle with water in it beside the oven. Repeat with the other pan of rolls. When rolls have cooled, split them and pile on your favorite sandwich ingredients. My favorite Ham Hoagie is shown below. Enjoy! Many thanks to the Conshohocken Italian Bakery for advice on this recipe. If you live nearby, run - don't walk - to their bakery. Would you mind if I featured this post up on the home page for a bit? Looks like a winner, thanks for posting and taking the time to research this recipe! I love a good Hoagie roll! Great post! I will definitely being trying these in the future. Thanks for the detailed instructions. They look beautiful. Many thanks for posting this recipe; it's kind of close to the heart. As a teenager, I lived for some years near Conshohocken, on the steep banks of the Schuykill River. "Conshie," as it was called, was definitely not the neat, restored culinary mecca it is now, but it was a center for hoagie and cheese steak roll production, made in what were probably highly illegal wood fired ovens built on the backs of some of the row houses. These were unadvertized mom and pop Italian operations, and they supplied the hoagie and steak joints in Shawmont, East Falls, Mt. Airy. You could even get wonderful Sicilian pizza if you talked to mom nicely. Back then, the big gun for hoagies was Red's in South Philly (9th and Wharton), while the cheese steak king, Pat's, was just about across the street. (Still running today.) But there were lots of mighty good pretenders elsewhere; just look for the line-up outside the door, any time. If you're back in the neighborhood, check out the Whitehorse Inn on Bethlehem Pike for a cheese steak hoagie, not bad, not bad at all. Thanks for bringing this all back to me. I'll definitely give them a try, wood fired, of course. Oh, and by the way: thanks for the memories! Great looking rolls and post, Don. Thanks for sharing some secrets and giving us pics of mouth-watering hoagie rolls! What flours are you using? What flours are you using? "AP" covers flours with a wide range of protein levels. "hi Gluten" too, although the range is probably not near as wide, and with very few nationwide offerings. With your (excellent) "Cemitas", I think you said you used GM AP, so I guess that was used here? National offerings for hg flour include KASL, and GM All Trumps, both having about 14.2% protein? Trying to figure the protein of your "blend", maybe then finding a matching single flour? How "chewy" are yours? Very? Carol Fields has a great discussion on the comparability of US and Italian flours on pages 34-36 of 'The Italian Baker'. Either from harsh farming techniques or climate differences, Italian flour tends to be softer by far than US flour. In fact, Italian breads (in Italy) are somewhat disappointing to the avid American baker. Keeping this in mind, I try not to overdo it on the structure when I bake Italian breads. To make them authentic, I add only a portion of higher gluten flour, in much the way an Italian baker would. So, my AP flour in this case is Gold Medal, because it's readily available. And the Hi G flour is made by Pendleton Mills, fairly easy to come by here in the Seattle area. It's either 13.5 percent or 14 percent, depending on the batch. I wouldn't call these rolls 'chewy'. Their texture gives way but doesn't collapse, which is the characteristic I love most about a good sandwich roll. And their texture is less silky than my Cemitas. Finally, because the guys at the Conshie bakery and Carol Fields both said it, don't substitute bread flour, or you'll end up with a whole different product! Very good, reminds me somewhat of Olive Garden breadsticks, minus melted butter and garlic salt on top. I didn't have any yogurt from which to make whey, here is an alternative method. Boil milk(I used powered milk+water) until just boiling, remove from heat. Stir in 1T of lemon juice to coagulate the milk proteins. Strain the "cheese" and use the whey(greenish in color). Thanks DW. I like this method for making whey, as long as the lemon doesn't dominate! 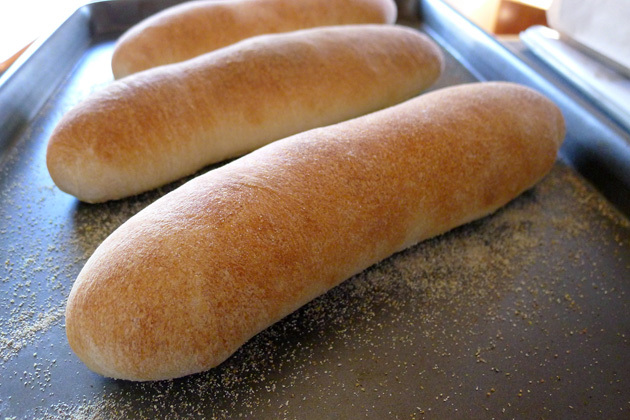 If your rolls reminded you of breadsticks, you either didn't let the dough proof for long enough or you noshed on the rolls before they had a chance to mature. I find that these rolls make the best sandwiches 4 hours after emerging from the oven. For up to 30 hours or so after that (stored in paper, not plastic) they will still taste fresh. I definitely noshed early, I like to try all of my breads straight out of the oven. Since whey is acidic, I believe that it helps mask any lemon taste that might be lingering. I also checked out the Conshy bakery website, they had the ingredients listed for their rolls. There were three of interest to me. DATEM: Scary acronym for Diacetyl Tartaric (Acid) Ester of Monoglyceride. Acts as an emulsifier, used to strengthen dough and help make breads with a springy, chewy texture. cornstarch: Used to soften breads, could also be used as a glaze to make bread shiny. The above is just my opinion, it would be nice to have a baker with more experience verify or contradict. I want to clarify: this recipe is meant to capture a sandwich memory, and was never intended to reproduce the Conshohocken Bakery's rolls exactly. Over the past 20 years, I have made a variety of rolls that have come close to what I remember as a boy, but they never were 'just right.' This time, I perfected the process. The bakery's input had to do with proof temperatures, steam bursting and protein content. While creating the recipe, I too came across this ingredient datem, and discussed it with the people at the Conshie Bakery. Datem allows the protein in wheat flour to more quickly absorb water, so it accellerates the proofing process. While important to a commercial bakery, speediness was not one of my concerns. My 8 hour or 14 hour proof does the same thing, just more slowly. If you read the original post (Click Here), you can see that my recipe is a direct result of my longing for Philadelphia's sandwich culture, which doesn't translate well to the West Coast, where I live. I also have on my site an overview of some sandwich joints we sampled last November. If you're interested, check it out at Philadelphia Hoagies and other Great Sandwiches. Hi, This is just awesome. 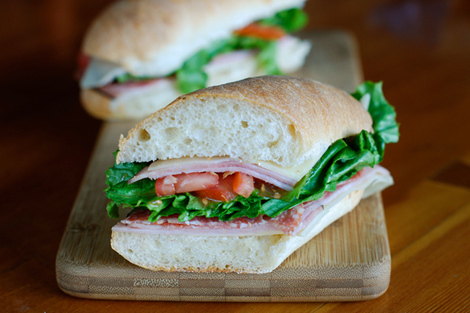 I came to The Fresh Loaf looking for an Italian hoagie roll recipe and there it was right on the home page. I lived in Philadelphia for 4 years and loved the ubiquitous Amoroso brand rolls that are used for cheese steaks and hoagies. This sounds like it will be close. What kind of high gluten flour do you use? The only thing I can get is King Arthur Bread Flour. Is that enough or would I need to add some vial wheat gluten flour to the mix, as well? I'm going to make this recipe now and will let everyone know how it works out. Did anyone try the dry whey? I love when things work out that way. Amoroso's is the roll of my youth, but it sounds like they got too big to supply every mom and pop sandwich shop directly, which is why my local (Pudge's) has been buying rolls more locally. As to HI G flour, I'm using a brand made by Pendleton Mills that's at 14%. Since it works out to less than a quarter of the flour I use in this recipe, I think you're safe using 1/2 All purpose flour and 1/2 bread flour. As you might see by the thread of comments above, true Italian bread is made from flour that's lower in protein than many American breads. Two things to be cautious about: don't try to move the final risen rolls off of the baking sheet or they'll collapse after a triple rise. And don't spray water on anything but the metal in your oven. I cracked the cover on my light the other day! So very excited to try these! Awesome post..thank you...you just made a lot of people very happy! Great tasting bread. Though when I made it, it did not brown at all. Just appeared white. Any suggestions? Thanks for all your kind comments. It's a pleasure sharing a recipe like this with such a receptive audience. You guys are great! I wouldn't use rapid rise yeast with this recipe if you want to be successful in producing a professional-tasting roll. As noted elsewhere, the Conshohocken Bakery uses Datem to speed the process of the protein gathering its ability to absorb water. For best results, 8 hours or more is necessary to make this happen without an accellerator. For years, in making rolls like this, I tried to speed things up and I was not pleased with the results. The crumb was 'brittle' instead of mature. As to the crust not browning, I suspect that either the salt content was not high enough (don't stint on the salt!) or your oven wasn't hot enough. I am baking in a Wolf oven, well preheated, and when my oven gets hot it gets HOT! Does using whey in a dough differ greatly from using just milk (scalded of course)? Whey has all the parts of milk except for casein and fat - the rich stuff. As soon as you add that back in, the crumb takes on some of those attributes. For lack of a better word, it gets creamier. On the other hand, without any whey at all these rolls taste too lean. I can only assume the whey is beneficial in enriching the dough in its long rise. I first used whey some years back when making pita bread and tzatziki. The yogurt for tzatziki has to be strained, producing whey as its byproduct. So I threw in the whey and ended up with pita bread that took on a whole new dimension. Now, if it's too difficult to make whey, you can probably use scalded milk for 1/4 of the liquid in this recipe. But it won't be a 'Real Italian Hoagie Roll' any more! Thanks for sharing your thoughts. Let me know if the sandwich roll recipe yields any more information. These rolls were wonderful ! Glad you liked the rolls. I wonder if you could shoot me an email to Sortachef at Gmail dot com and let me know how the mozzarella turned out. As we make LOTS of pizza around here, we've got homemade mozzarella in out sights as the next big adventure. Does the acid in the dough (from the whey and citric acid) is just for flavour or it serves another purpose? Yeast does its job better in a slightly acid environment, so the citric acid and whey are there to help this along. You get a better rise with them in the dough, and the slight tang they impart to the rolls makes them taste just right! hoagie named for a cigar? When I was in Philadelphia in 1970, I was introduced to the hoagie sandwich. Someone explained to me that it was named hoagie because it looked somewhat like a stogie (an oversize, cheap cigar), which was sometimes called a hoagie. The Hog Island etymology notwithstanding, is there anything to the cigar connection?